Amputees who use powered prosthetic ankles may be able to avoid the energetic costs typically associated with prosthetics by cranking up the power provided by their devices. 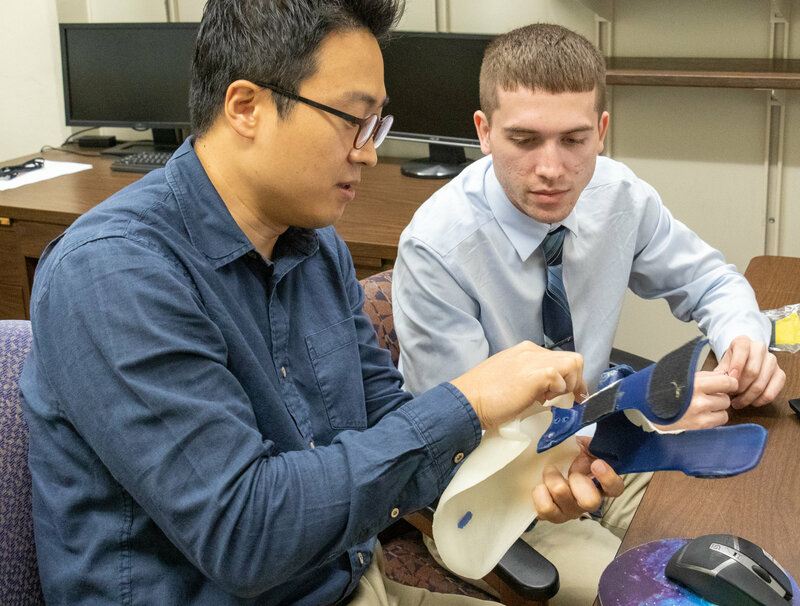 A UCF engineering professor recently published a study in Scientific Reports that shows that people with transtibial amputations—the loss of a limb below the knee—may improve their walking ability if they change the power-setting on their devices. Hwan Choi, who received his doctorate in engineering from the University of Washington, is an assistant professor in the UCF department of Mechanical and Aerospace Engineering. According to a study conducted by the National Institutes of Health, approximately 185,000 amputations occur in the United States every year and 49-95% of lower-limb amputees reportedly use a prosthesis. Most of those on the market are passive prosthetics. On average, amputees spend up to 30% more energy than unimpaired individuals when performing tasks such as walking. This could be due to the fact that most ankle prostheses are passive-elastic, meaning that they can store and release energy when they come in contact with the ground but are unable to perform positive net ankle work that allows for muscle shortening contractions to occur. In fact, these prostheses are only able to provide one eighth of the power of the intact gastrocnemius and soleus muscles, the key muscles that support and propel the body during walking. As passive prostheses increase the energetic demand on the user, individuals may have to compensate by increasing muscular effort in the residual or intact limb. Powered ankle prostheses, on the other hand, use actuators to reduce the increased metabolic costs placed on amputees by delivering positive work. BiOM (now known as EMPOWER), the only commercially available powered ankle prosthetic, uses a visual display that allows the wearer to tune the power setting on the device. Ideally, they would select a power setting between 0% and 100% that best approximates that of a healthy ankle at the user’s preferred walking speed. But the question remains: how much power should the prosthesis provide? Too little power and they may experience the same metabolic costs of those using passive prostheses, but too much and they may experience problems such as knee hyperflexion and increased energy absorption in the knee that can raise the metabolic costs of the user. Choi, along with coauthors Kimberly Ingrahm, David Remy, Emily Gardinier, and Deanna Gates from the University of Michigan, tested ten individuals with transtibial amputations. They measured the metabolic cost of transport (COT) and the BiOM’s net ankle work at different power settings, while the amputees walked on a treadmill with the BiOM ankle. Choi said that they discovered that the ideal power that reduced metabolic cost was actually greater than biological norms. In other words, the best tested setting actually decreased the amount of excess energy used by the subject more than the prosthetist-chosen power setting. Across participants, power settings greater than 50% resulted in lower COT, but the best tested power setting was actually higher than the prosthetist-chosen setting. In fact, on average, the power setting that minimized energy costs corresponded to approximately double the net ankle work of the biological ankle. So while powered ankles may be more beneficial than passive prosthetics, amputees can actually increase their activity level when prosthetists change their goal from achieving approximate biological ankle kinetics to minimizing metabolic costs. According to Choi, with minimized metabolic costs, transtibial amputees have a greater chance of remaining active, improving their quality of life, and preventing a number of health consequences, including diabetes and cardiac disease.